When cafes and roasteries turn raw coffee beans into the drink we know and love, there are a number of byproducts produced that often go to waste or end up in landfills. Thankfully, pretty much all of these byproducts are compostable, recyclable or upcyclable. From the coffee husks left after roasting and coffee grounds after extraction, even the burlap/jute sacks the coffee beans travel in. All of it is actually an organic matter, produced organically, that breaks down into simple compounds that go towards enriching the earth it is given back to. Any budding gardening geeks should ask themselves: why not use resources you might already have at your fingertips instead of adding it to the city's swelling landfills? Below are a few ways you can get more life out of coffee byproducts, even for small gardens. Spent coffee grounds are a useful addition to the garden, especially for making compost, as they have a similar nitrogen to carbon ratio as manure. This gives your garden an extra boost of energy, which is appreciated by most plants (especially green leafy crops such as lettuce, corn etc. ), and is a major fuel for microorganisms that help break down organic matter to form compost. When combined with a carbon source (e.g. fallen leaves, straw, newspaper etc.) this provides good levels of phosphorus and potassium too. In fact, it is possible to make a complete, nutrient-rich compost by using just coffee grounds, shredded newspaper and a bit of kitchen waste. Coffee grounds are a great addition to your worm farm (they love it! ), which improves soil structure by aerating the soil and creating micropores for water to infiltrate, and make nutrients readily available to plant roots. Grounds are rumoured to deter snails and slugs. They don't like the texture or aroma - so sprinkle some around crops like lettuce, cabbage etc. to keep them relatively hole-free! There is a theory that cats don't like the smell either so it can be used to stop naughty kitties digging up your newly planted bed. A common misconception is that grounds are acidic and good for plants that prefer more acidic soil. However, most the acidity is water soluble and ends up your drink rather than the grounds, which have a pH level close to neutral. Underground HQ produces copious amounts of coffee husks or chaff from roasting the green beans, and this byproduct can be used as a mulch to conserve water and suppress weeds - the key to lay it out on the still day and water it so it doesn't all just blow away (or use it in a glass house). The husks are rich in nitrogen and potassium, as well as cellulose and other organic matter that soil life thrives on. It can also be used as a soil conditioner by simply digging it in before sowing. Coffee grounds are available from most UG cafes, husks are available from HQ only. Know that when you use UG coffee byproducts that they are from organic sources, so you won't be adding any unsavoury nasties to your garden! 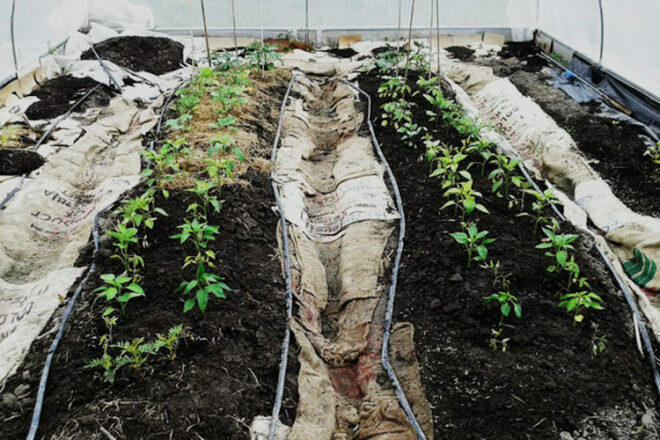 Coffee sacks make good weed mats for pathways (newspaper or cardboard underneath suppresses weeds even better) or dry mulch that prevent strawberries, cucumbers, pumpkins etc. rotting on the ground. Even if you had very little space outside, you could still grow potatoes in a few sacks on a porch so long as it gets at least 4 or 5 hours of sun a day. There's practically nothing to it! Throw about a foot of dirt (and maybe some coffee compost) into rolled up sacks, plonk your seed potatoes just under the soil surface, and water them thoroughly about once a week or fortnight (depending on how dry it is). Then you just sit back and watch them grow! Occasionally unroll the sack and mound them up, i.e. when your shoots get leggy, usually 2 or 3 times suffices. The main thing is to only expose the leaves to the sun, this insures you don't get green potatoes, which are the less tasty, more toxic variety! Drainage can be further improved by keeping sacks on a pallet or over gravel, and by using soil that is not too clayey Clay particles and water molecules can get locked in an eternal embrace which leaves out oxygen, so the roots cannot breathe. If given a bit of TLC every so often you should get a pretty good haul of potatoes in each sack. Just rip her open and fish out the spoils! Sacks are available from Underground Coffee Roasters, 190 Durham St Sth, Christchurch, for a gold coin donation. All proceeds go to various charities such as SAFE and Christchurch City Mission.